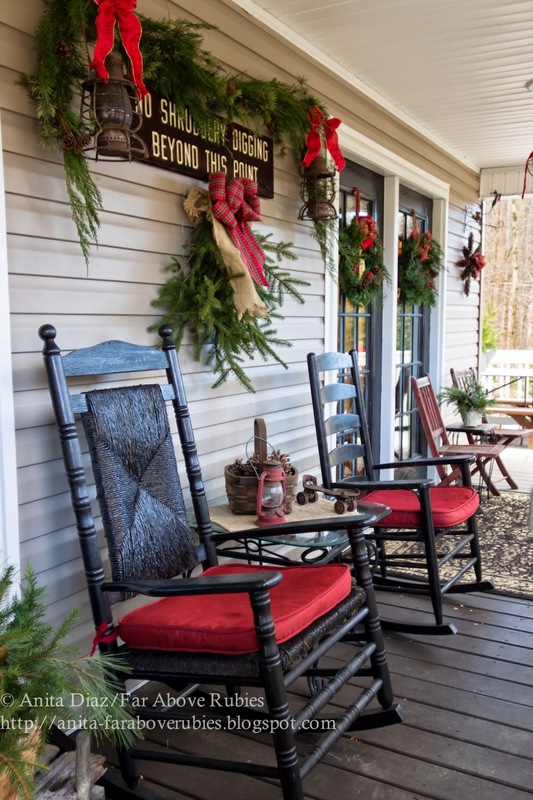 I like for my home to reflect where it is and the culture around it, so naturally, we have a country Christmas porch here in the North Carolina mountains. I tuck branches of greenery into pots filled with dirt for outside. Not only will they survive all winter, they will most likely root by spring and you can plant the seedlings:-) I know this firsthand. 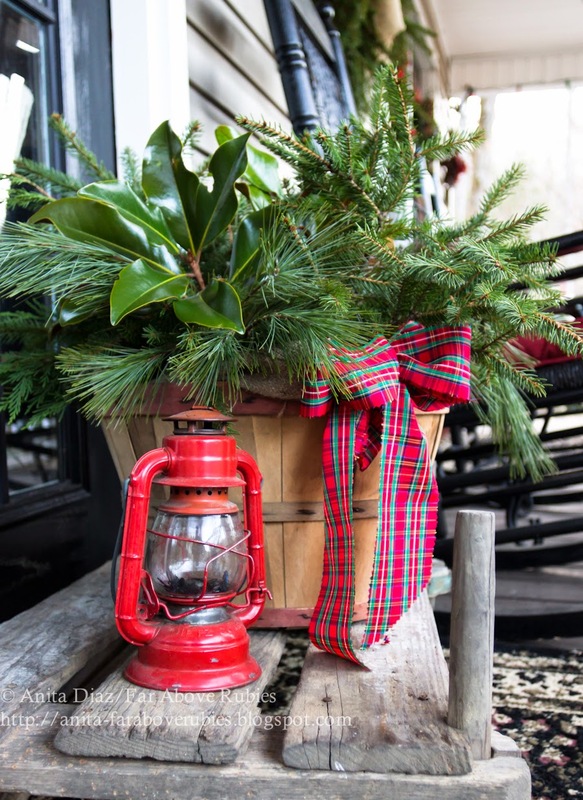 I have simply added fresh greenery to baskets and pots and used a few of the old things from around the property to bring a little Christmas cheer to the porch this year. 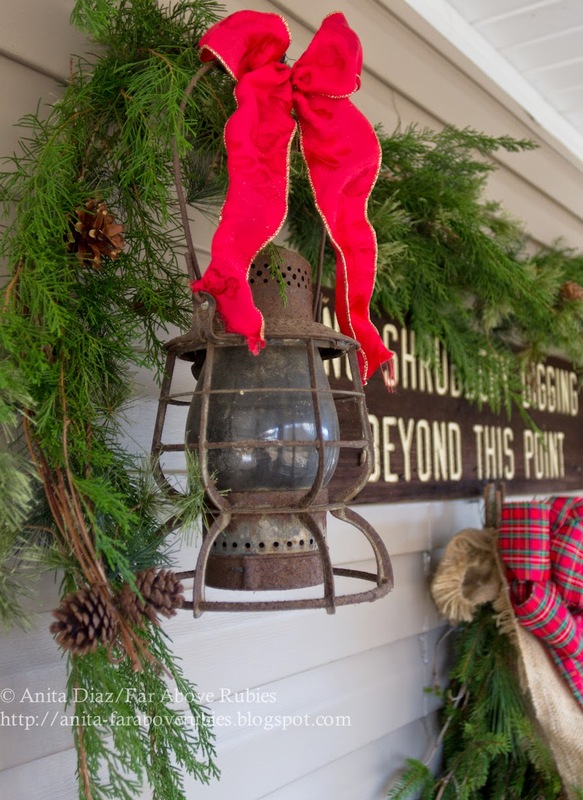 I draped greenery across the old sign and tied red ribbons onto the antique railroad lanterns. My grandfather's little chairs have weathered to the perfect shade of red. I made this star from pinecones last year and never really liked it. I added the ribbon for some color and it's fine out here. We did have a dusting of snow and might get some for Christmas eve. 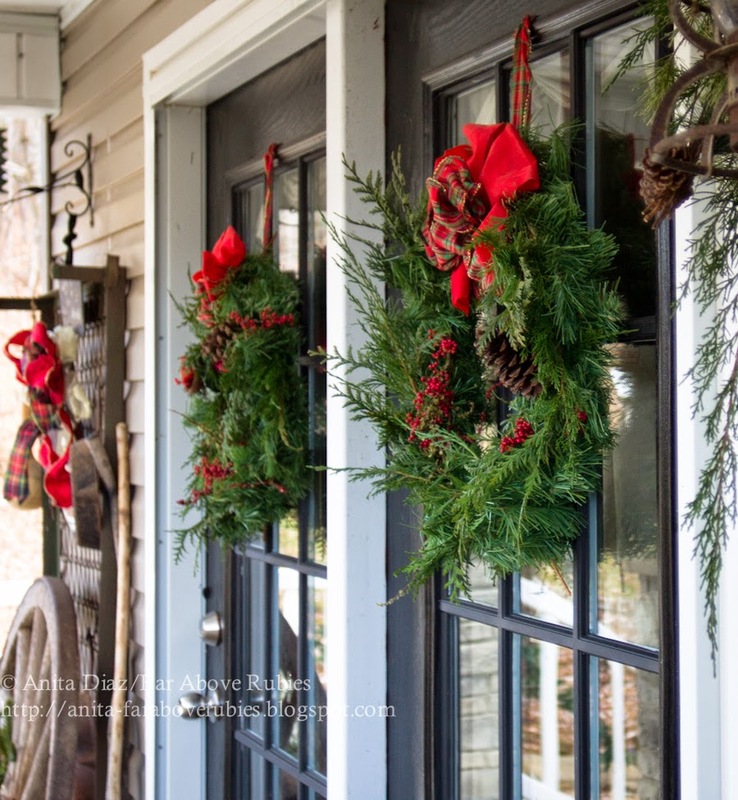 Instead of buying or making fresh wreathes for the 10 windows I put them on, I simply add fresh greenery to inexpensive faux wreathes. 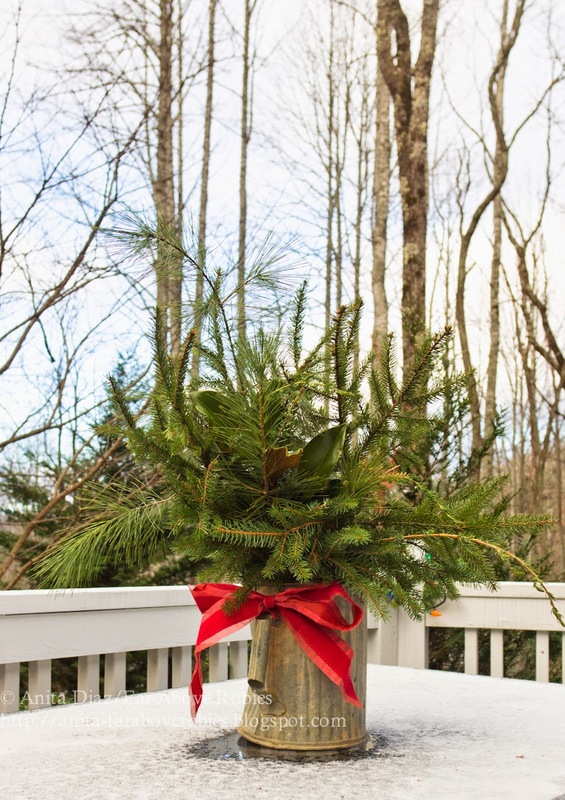 They make a great base for the fresh greens and it's SO much easier than making them from scratch -- not to mention less expensive than buying 10 wreathes. They look great too. I just pull out the dead stems when I take them down and store them for next year. He has not discovered these ribbons yet, either. 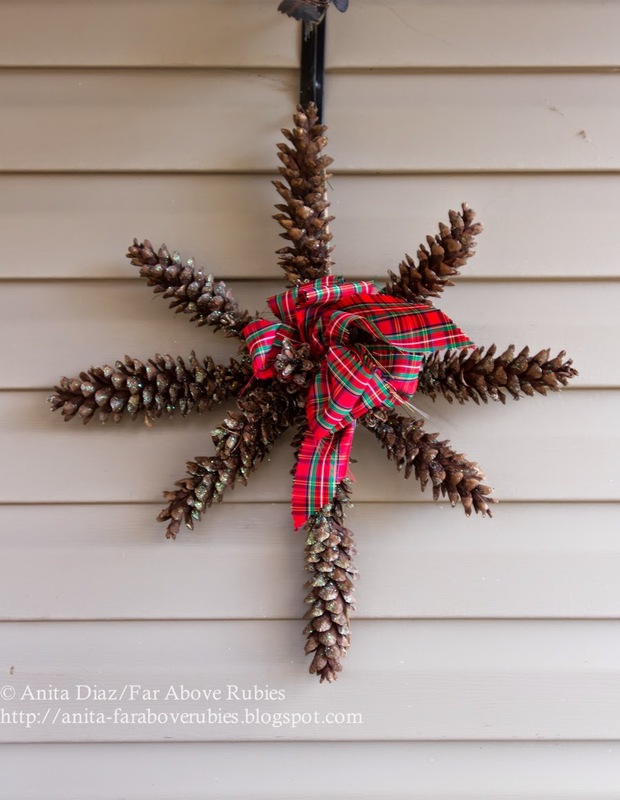 Simple branches of balsam and white pine, accented with tartan and red ribbon. Instead of white lights, I use colored lights all around the porch and railings, and the color looks awesome at night. I love, love, love changing from the clear lights. Plus, my parents get to enjoy the lights at night and they love the retro look of color. It's just looks festive and happy. That is just about it for my Christmas posts! I will put everything together for a home tour, though, on Monday. Always so warm and inviting Anita! 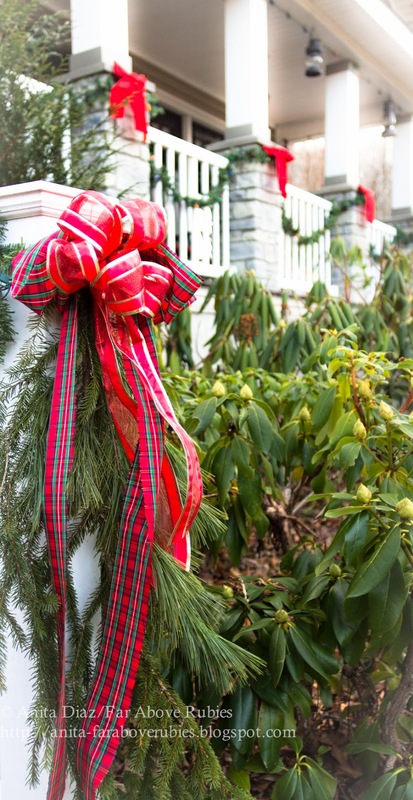 I luv how greens and s red bow just imparts such a happy holiday feel. As always, it is beautiful Anita. 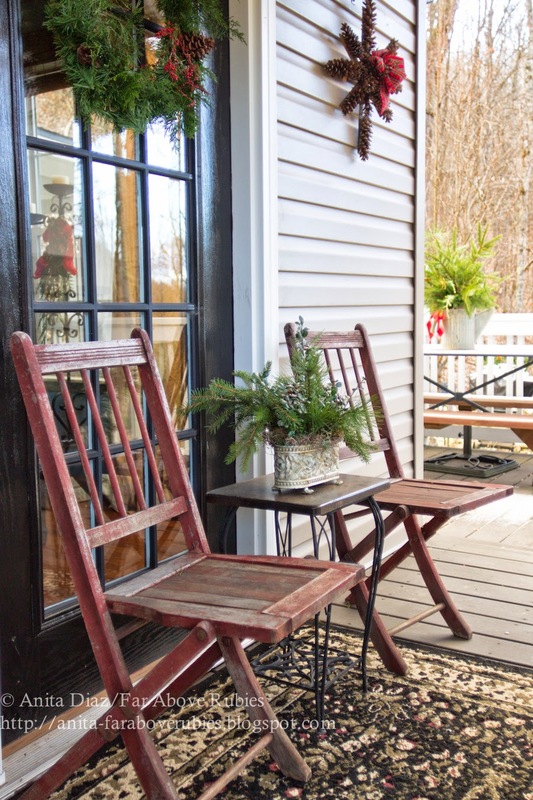 Anita, your front porch looks like a picture postcard! What a gorgeous way to welcome family and friends this season of the year. Beautiful, Anita! 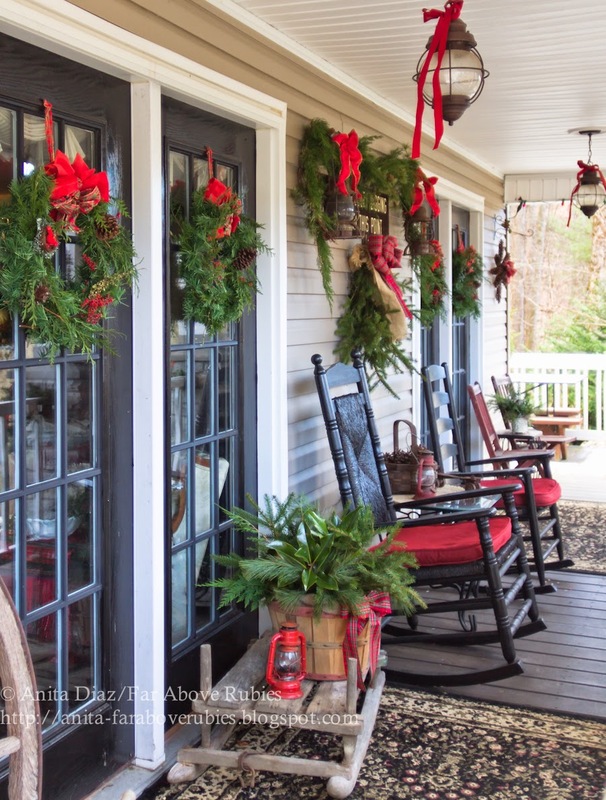 Such an inviting and festive porch! Anita, I want to tell you how much I enjoy visiting Far Above Rubies. You bring joy and inspiration with every post. I adore your natural, elegant style. Thank you for sharing with all of us. I love colored lights too. Sort of take me back to my childhood. 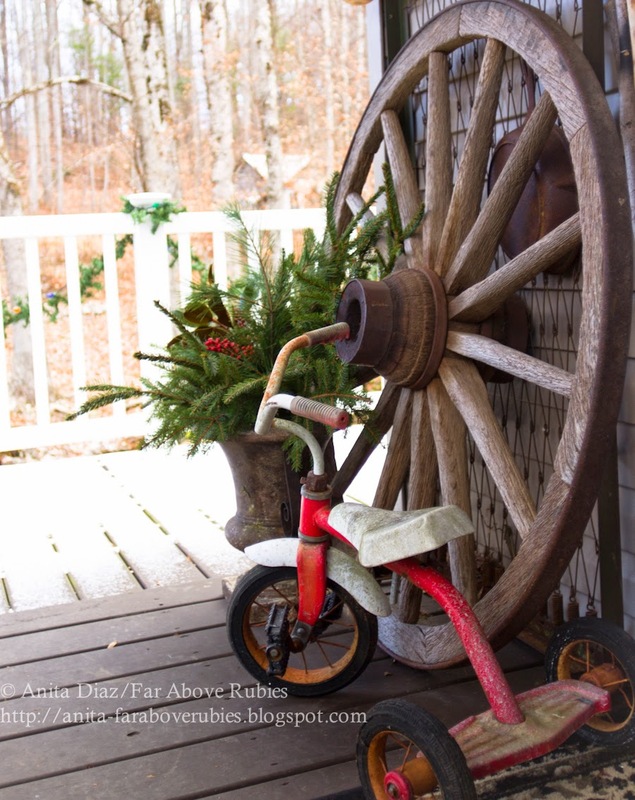 Love that tricycle too. How fun! Everything is absolutely beautiful, Anita...from the beautiful porch to the details you have created. Life in the mountains is wonderful as you have shown. 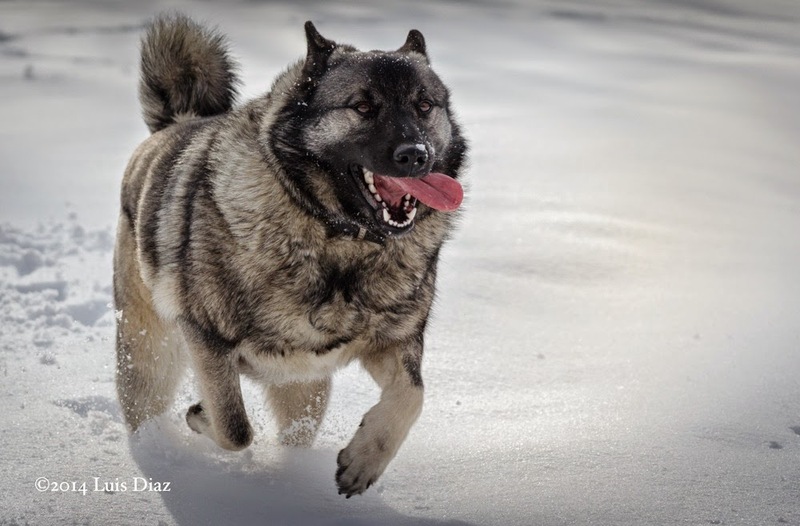 Your mother's dog is a beauty! Bears? Oh no!! I love that you are using colored lights, they are my favorite! Beautiful winter porch, but I'm waiting to see those rhodies bloom next spring! Gorgeous house in the woods... my dream house, actually. Enjoy. 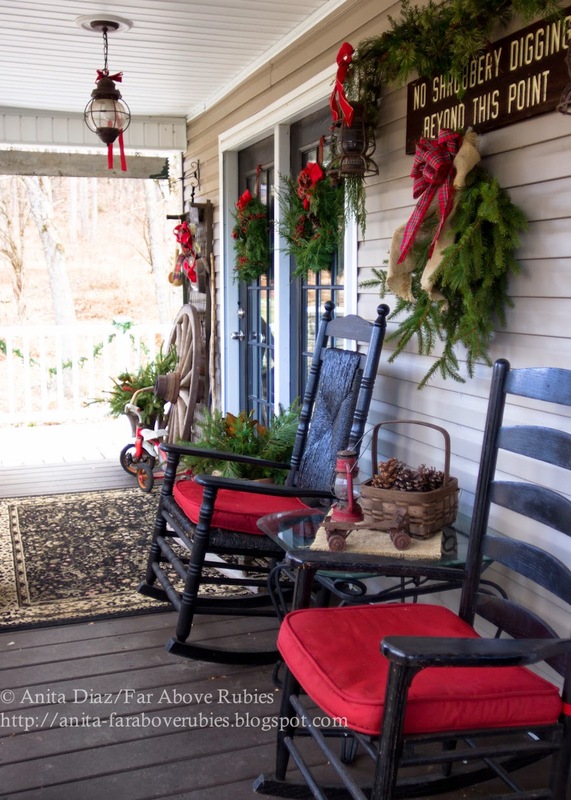 Beautiful front porch and yes you are a wonderful ambassador for the NC mountains! We had a dusting this morning down here, so I hopefully you may have as well :) Merry Christmas! So very pretty. I especially love the fir branches and southern magnolia together. 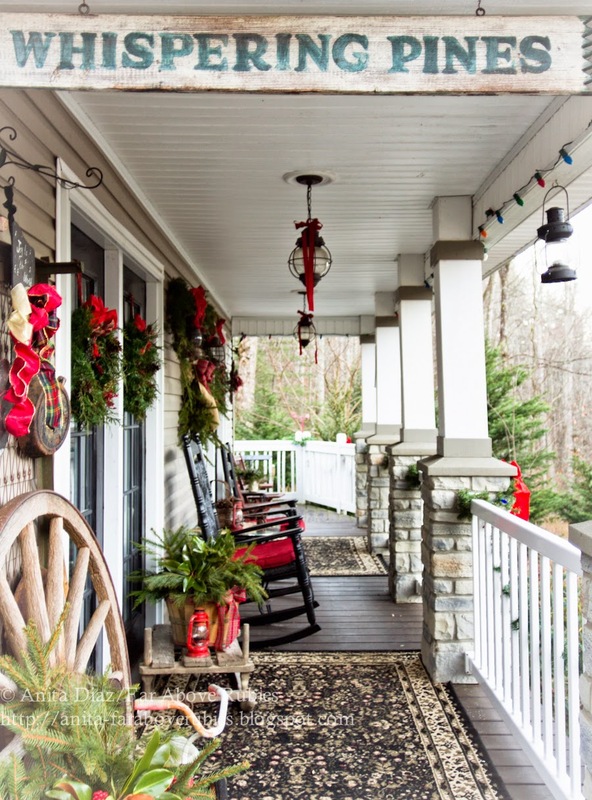 A special Christmas porch indeed! I am SO glad I saw this post, Anita! 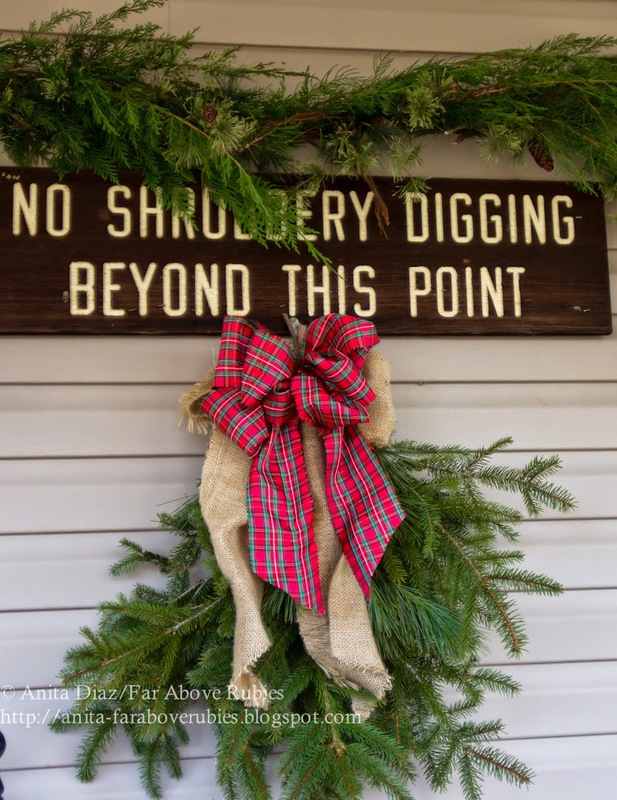 My goodness gracious...you've not only done a slam dunk job of decorating inside, but you've endeavored to make the outside just as cheerful and relaxed and inviting! I am a pinning fool tonight on your posts!!! 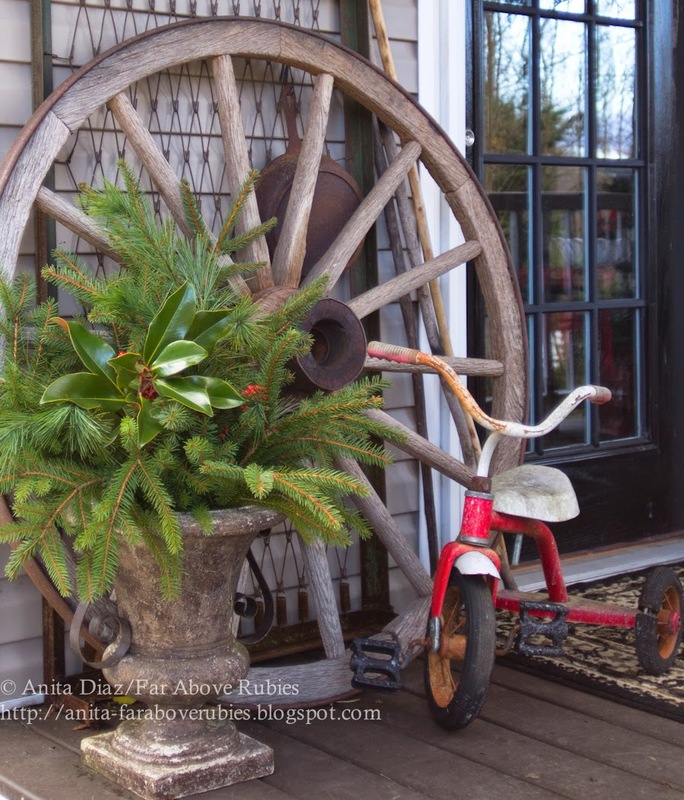 I love the idea of adding a few sprigs of fresh greenery to faux wreaths. I am going to take that bit to heart and use it next year. I do it on wreaths used indoors, but have never thought to do it on wreaths on the windows and/or doors. Great thinking! I am also QUITE fond of the way you used cut branches for the pots outdoors. I have 2 pots sitting on our front porch right now devoid of any life because we ended up planting the evergreen trees that were in them since they were starting to get root bound. I'm going to take a cue from you and put in some cuttings to dress up those bare pots and bring a bit of color and texture to the porch! Thank you!!! Beautiful pictures! Thank you for sharing your good taste and creativity!